We have gone over methods for downgrading your iPod Touch or iPhone from the iOS 4.0.2 firmware to the iOS 4.0.1 firmware. However, today we have received word from Bigboss about a method that may work for downgrading your iDevice from the iOS 4.0.2 firmware to the iOS 4.0.1 firmware without any SHSH blobs needing to be saved prior. The only reason that this method is supposed to work is because of the similarities between the iOS 4.0.2 firmware and the iOS 4.0.1 firmware. This method will not work for other firmware files like iOS4 to 3.1.3. I have not actually tested this method out, so I cannot confirm that this works 100%, but if you absolutely need to downgrade this is worth a shot. Again this method is supposed to work without needing to have saved your SHSH blobs. 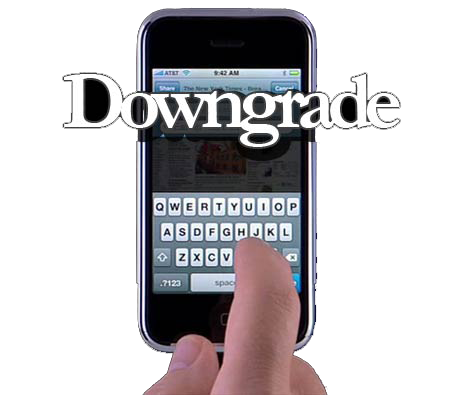 You should be able to downgrade from the iOS4.0.2 firmware to the iOS 4.0.1 firmware. Step 1) – The first thing you will need to do is download the iOS 4.0.1 firmware, from our downloads section. file from .ipsw to .zip to do this. Step 4) – Now you will need to download the iOS 4.0.2 firmware from our downloads section. Once you download it you will need to open it with winrar or winzip. Note: do not exact it. Just open it and leave it open. You must use this exact file and do not create a new one. If you have to create a new one for reasons like you are on OSX, then use zip command line not explorer or finder to make the zip. I will assume you are using the original file opened in winrar for the rest of this guide. Step 5) – Once you have the iOS 4.0.2 file open in winrar or equivalent; take all the files from the 4.0.1 and drag them over to the 4.0.2 zip archive that you have open. Step 6) –Delete all the dmg files that have 002 at the end, leaving only the 001 files left. Step 7) – Save the archive. And rename it back to .ipsw if you changed the name to get winrar/winzip to open it. Step 8 ) – Once you have renamed your firmware file back to an .ipsw file, you will need to add 74.208.10.249 gs.apple.com line to the hosts file. Need help with this? Read the following post. Step 9) – Now you are done creating your firmware file. The next thing you must do is put the device into dfu mode, and open iTunes to restore the firmware you just created. Make sure you give credit to CodeBlue, for originally discovering this method of downgrading. If you tried this out please let us know if it worked or not! I tried it, but it didn’t work. I got the same error as if i were trying to restore using the 4.0.1 ipsw. I got error 3194. Well i made it work in the end. I did the shsh blob thingy to make it work. The only way that I got it to work was to open the HOST file through notepad in admin mode. I used 74.208.10.249 gs.apple.com . Also when I changed the 4.0.2.ipsw extention to .rar. After i was done copying and deleting I changed it back to ipsw. Final note when it restored and finished i got error 1004 but all you have to do it log out and and then log in back into itunes. And used unbrella to kick it out of dfu mode. Thanks btw, I don’t like giving up. Took me a few hours to finally get it working. I am glad you got it to work ferrousone, that is great news! So after you kicked it out of DFU mode everything was working fine? what you did is it for iphone 4 or 3gs? the buildmanifest.plist is a file in the firmware that controls how the firmware file installs (builds). Is there a way to do this with iPod touch 3G? I did the downgrade on the iPhone 4. After I kicked it out of dfu mode I restored from my backup from earlier that day. Which Made me panic thinking it was going to ruin everything. But it turned out everything worked fine. Ferrouseone, was this a new out of the box iphone 4 with iOS 4.0.2 on it? A lot of people are saying that they success stories with this guide are because people already had an SHSH blob on file with Cydia for that device. Could you please clarify. I have a friend with a new Iphone 4 who cant get his phone downgraded.